For the most part there is zero conversation inside city hall about managing water demand by slowing or perhaps putting an indefinite hold on approving water supply assessments and construction permits. Today's growth in Los Angeles is 'big', it's 'dense' it's 'vertical' and it's pervasive. 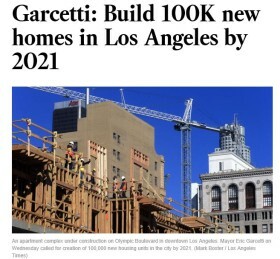 Mayor Garcetti last September announced that he wants to expedite construction to build 100,000 new units by 2020 but where's the water? 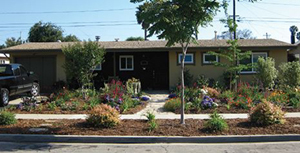 Clearly there is a disconnect between the city's growth ambitions and the effort to force residents to comply with drought restrictions. Regardless of how efficient the projects are, they still create a huge demand for water when there is already a huge deficit. Cities throughout California, particularly Southern California need to re-assess their plans for growth and throw away their compliance for bad laws like SB 1818 and housing policies like RHNA that blindly approve developments to meet SCAG's or SANDAG's desktop population targets without assessing if there is sufficient water to provide for them over the long term. 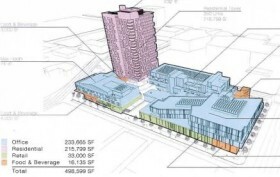 Pictured above: The Playa Vista II development will add 560 af/y demand to the city's water deficit.